Hofman, Michelle. “The Center Art Gallery has a Long History.” Calvin College Chimes. 29 September 2017. Everyone is at least somewhat aware that the Calvin campus contains an art gallery. Hopefully they know where it is. They might have even gone inside, and looked at the works of art that hang from the white walls, and rest on pedestals scattered around the room. The gallery is bright, and relaxing. A quiet space to go and get lost in the curves of a sculpture or in the strokes of paint on canvas. Read on here, and take a visit to the Calvin College Center Art Gallery today! Cultured.GR contributor, Elizabeth Rogers Drouillard shares a bit about the fiber arts resurgence in the DIY crafts scene, and highlights an upcoming fiber arts workshop with Calvin College’s Open Studio Night. Rogers Drouillard, Elizabeth. “Embroidery workshops showcase slow fashion, encourage sustainability.” Cultured.GR (5 May 2017). Parliament the Boutique and the Calvin College Department of Art & Art History both have upcoming opportunities to slow down and learn a new thread craft. Both the patch embroidery workshop at Open Studio, programming from Calvin College previously located in the former (106) Gallery, and the sashiko workshop at Parliament the Boutique are in response to local and national increased interest towards fiber arts, slow fashion, and a sustainable, hands-on value of making. “There’s been a resurgence in fiber arts over the past few years, and many Open Studio attendees have expressed interest in learning how to knit, crochet, embroider, etc.,” says Paula Manni, Calvin College Arts Programming Coordinator and former Gallery Assistant at Calvin College’s 106 Gallery. Read the entire article here, and be sure to check out additional Open Studio Night events through the Calvin College Department of Art and Art History! A huge congratulations to art professor Anna Greidanus, recipient of a 2017 Calvin College faculty award for Community-Based Teaching. What a wonderful testament to Anna’s dedication and care: a well-deserved honor! Looking for a unique and life-giving summer internship experience? Explore the various internship opportunities with the Grünewald Guild–a retreat center located in the Wenatchee National Forest of North central Washington State. The Grünewald Guild is a community that “fascilitates the exploration between art and faith/spirituality. Guild internships seem to work best for students who are self-motivated, flexible, and comfortable taking ownership of their projects. Our work environment is causal and highly relational, with abundant opportunities for collaboration. We place a strong value on inclusivity and are passionate about actively recruiting interns who can enrich our community with diverse experiences and outlooks. Our 9-week summer internships are unpaid, but do provide room and board as well as one free class. We have opportunities in a number of areas, including Art Studio Management, Media & Marketing, Community & Hospitality, and Food Service. Congratulations and good wishes to Calvin College Art Alumnus Bjorn Sparrman. 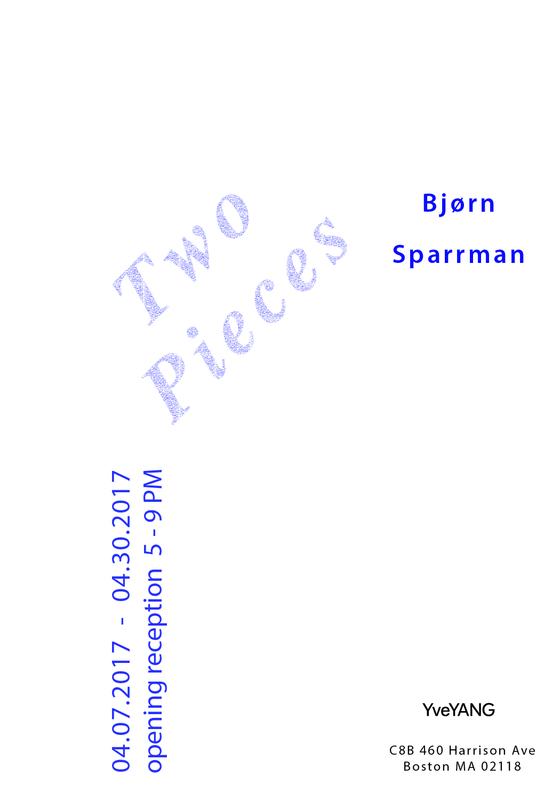 Sparrman’s solo exhibition Two Pieces will be on view at Boston’s Yve YANG Gallery April 7 – April 20, 2017. Sparrman received his BFA at Calvin College in 2012, and his Masters of Science, Art, and Technology from MIT in 2016. Yve YANG Gallery is pleased to announce Two Pieces, a solo exhibition by Bjørn Sparrman. Two Pieces will feature two pieces side by side at Yve YANG Gallery. Exhibition dates are from April 7th through April 30th, 2017. The opening reception will be on Friday, April 7th, 5pm to 9pm. Yve YANG Gallery is pleased to announce Two Pieces, a solo exhibition by Bjørn Sparrman. Two Pieces will feature two pieces side by side at Yve YANG Gallery. Exhibition dates are from April 7th through April 30th, 2017. The opening reception time will be on Friday, April 7th, 5pm to 9pm. Stability is the net zero-sum of motion. Stability is attributed to things. Instability conveys meaning. The two works presented invert the ways in which we rely on stability and expect instability. In The Sculpture Makes the Viewer Revolve Around Itself, a handheld camera focuses on various objects. Projected on a thin sheet of stone, the image is stabilized such that the subject of the video remains fixed on the screen. The frame jumps around as is must to accommodate the filmmaker’s hand. The second piece, Image of the City, consists of construction scaffolding arranged in a grid. Low frequencytransducers animate the structure with inaudible vibrations derived from the sounds of animals and conversations. From a distance the structure is completely still and quiet. Only when touched sat on is the stone found to vibrate. About Yve YANG Gallery Yve YANG is a gallery that presents emerging and newly established artists from all over the world. It is committed to carefully tracking the ever emerging technological moment alongside artists who wrestle with the conditions that this moment presents. This task requires a constant reconsideration of disciplinarily, forms of knowledge and representational modes. Yve YANG is eager to see the practice of art in turngenerate its own technologies that shape the world and our perception of it. We believe great art is not just embellishment, but rather is an essential act that inspires the progression of human history. Andrew Steiner (Feeding America West Michigan), “Local painter to host art sale in support of hunger relief.” The Rapidian (15 March 2017). Read the full article (and for sale details), see here.